Purchasing a home with a long list of home renovations in the works (sometimes months and years down the line) can be fun and overwhelming at the same time. 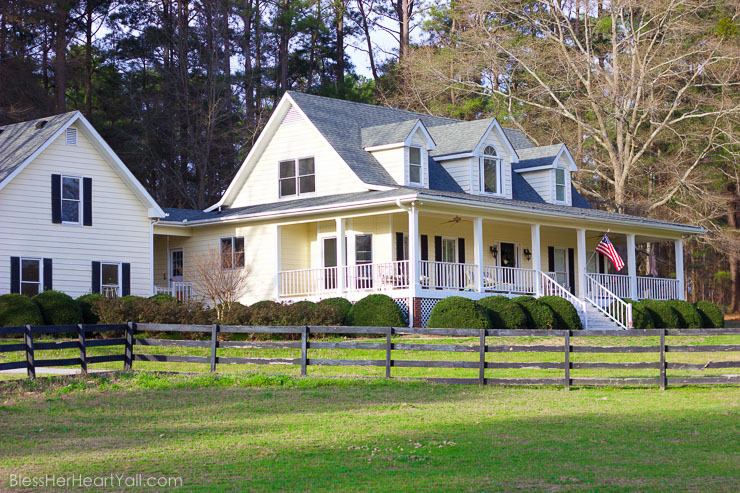 Here is the new-to-us dream home in disguise, our currently fugly southern house reveal. 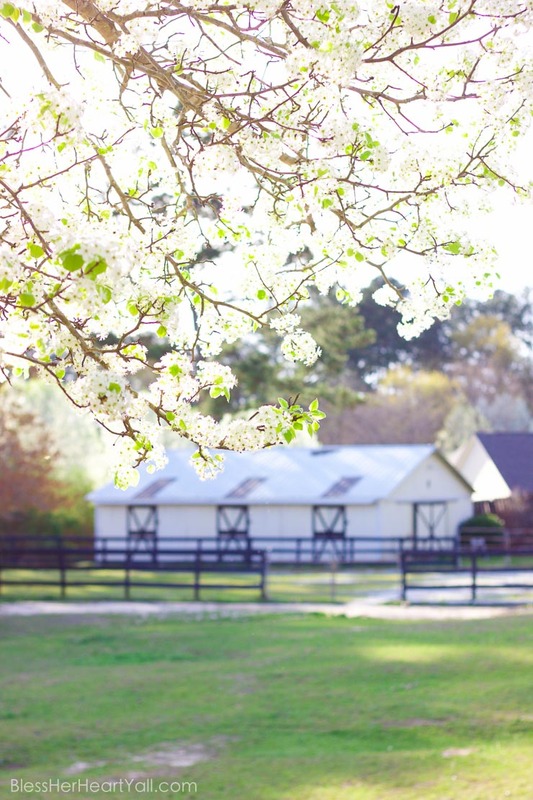 With all the crazy happening the past few weeks, I’m not sure I did anything but mention here or there in a blog post or on social media that we also managed to barely squeeze in selling our townhome and purchasing and moving into a new-to-us horse farm that is our dream house (in disguise! It needs a lot of work y’all!). Phew! It’s been crazy around here! I thought it was only proper, as the boxes start to get unpacked, that I do a fugly southern house reveal, because well…. right now it is a bit fugly (but we looooove it!) and two, I have a feeling that there will be many home renovation projects that I will want to share with y’all along the way! There needs to be a good before and after for the after to mean anything, right?!? I also want to say that I am truly grateful for everything that we do have right now. I understand that there are many others out there far less fortunate, and I know that we are so blessed. Many of these pictures show cosmetic issues that I would like fixed or upgraded at some point, other problems need to be fixed up sooner than later. But we are so fortunate to be in the place where we are right now! 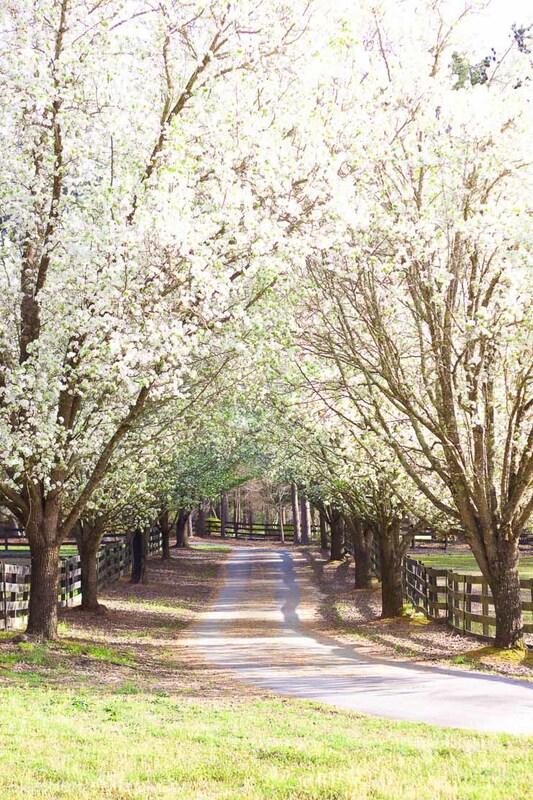 Driving up the tree-lined driveway, the property looks pretty darn good right now. The Bradford Pear trees are blossoming and gorgeous (I guess they smell really bad but I don’t smell the stink!). The outside, for the most part, is decent at present…. and then…. So there’s that 1993 (the year that the house was built!) red paint and that colorful floral border (the exact wallpaper that we had in our sitting room in one of our houses growing up! Bringing back memories! Crazy, right???). It’s got to go. Not only does it not go with any of our decor, but it makes the large and open room look much smaller than it is. So light and bright is going to be the winner in this room I feel! We have a beautiful wood staircase underneath this busy (yet expensive) stair runner. 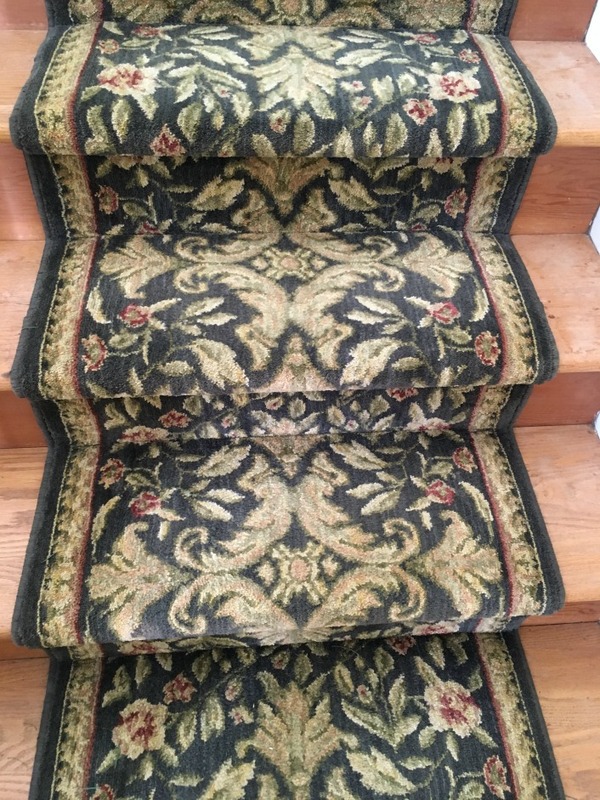 I like the soft plush feeling of the stair runner (and it may be a good idea with the talk of kids in the near future), but the busy, outdated pattern has got to go….at some point. It’s not on the top of my list to conquer right now. I’ll get around to it. There are three bathrooms in the house, two of which need a lot of help. The guest Jack-and-Jill bathroom above is very dated. 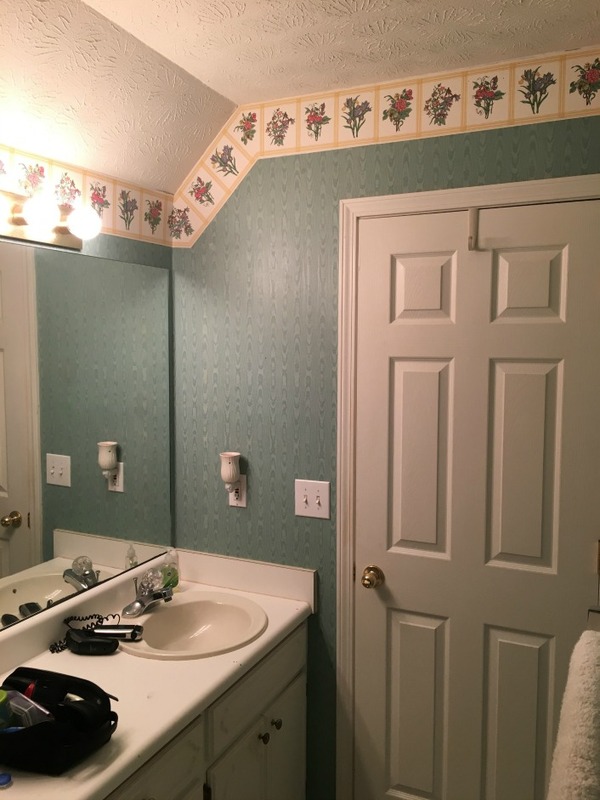 It needs the wallpaper removed, a new countertop (it is really trashed and beat up), the vanity refinished and repainted, and new light fixtures. This is part of our master bathroom. 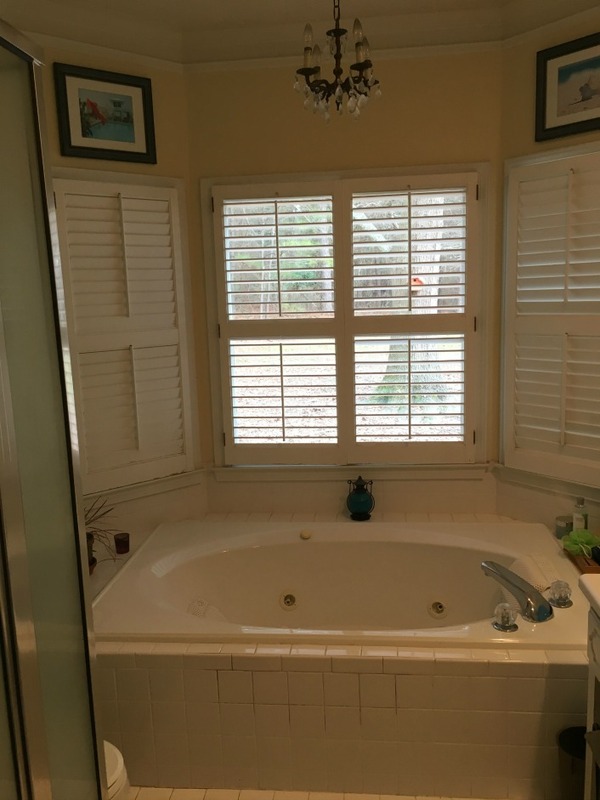 I love the tub overlooking the bay window. How cool! But the jacuzzi no longer works, the tiles are literally falling off and out of place, and the bathroom is just plain laid out very awkward. It also needs new countertops, and second vanity for the mister, new flooring and lighting, and the largest issue is the leaky shower (which we are currently not using until this bathroom is renovated) that leaked into the subfloor and made a huge mess behind the scenes. So we need to tear everything out, replace the subflooring, check for mold, and reconfigure the whole room. Calling Roto Rooter! Easy peasy, right?!? But there’s that bay window though! The third bathroom is dirty and dingy but is in fairly good condition compared to the other two. Yes, this one is bright purple and lime green. Need I say more? We need to repaint the walls and replace the lemon carpeting. The other guest room is a dirty cream at this point, and needs the same love as it’s skittle-colored counterpart. 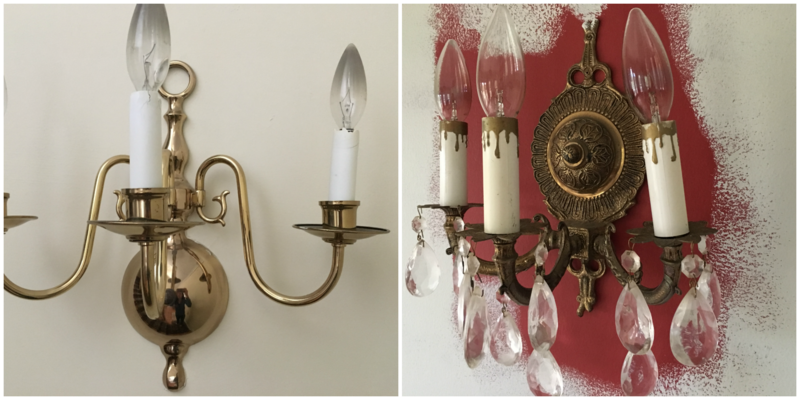 I couldn’t stand the red dining room walls, so yes, I started painting before I could even have the Hubster take off wall sconces. 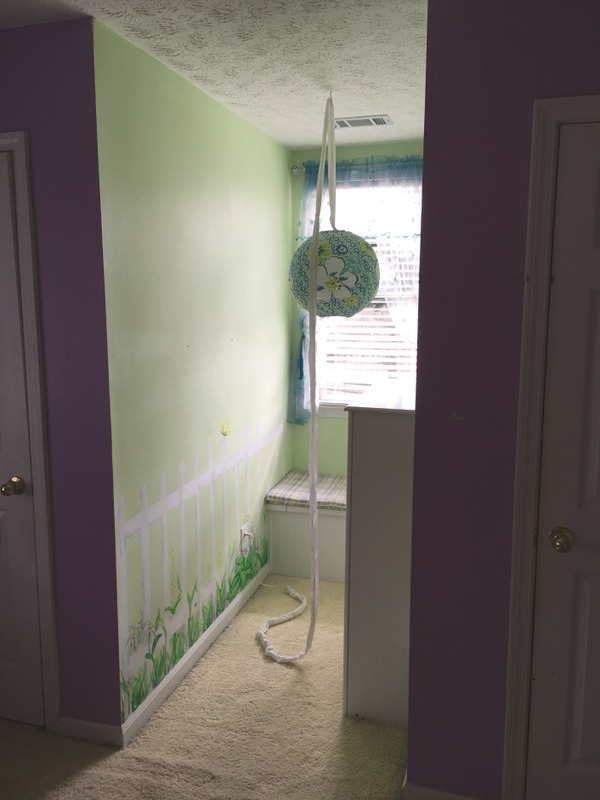 When in desperation… paint the walls! So the house is riddled with early 90’s decisions, and these wall sconces are part of that riddle. But why? Why 90’s? Some things that came out of that decade were so great! Other choices were not. So off they will come! For the most part, the kitchen will stay the way it is until we get a few of our other projects out of the way (at least that is the plan. Sometimes kitchens leak or break…. boo! And another call to Roto Rooter.). The custom cabinetry is dated but in fairly good condition. The countertops could use a bit of work, sure. 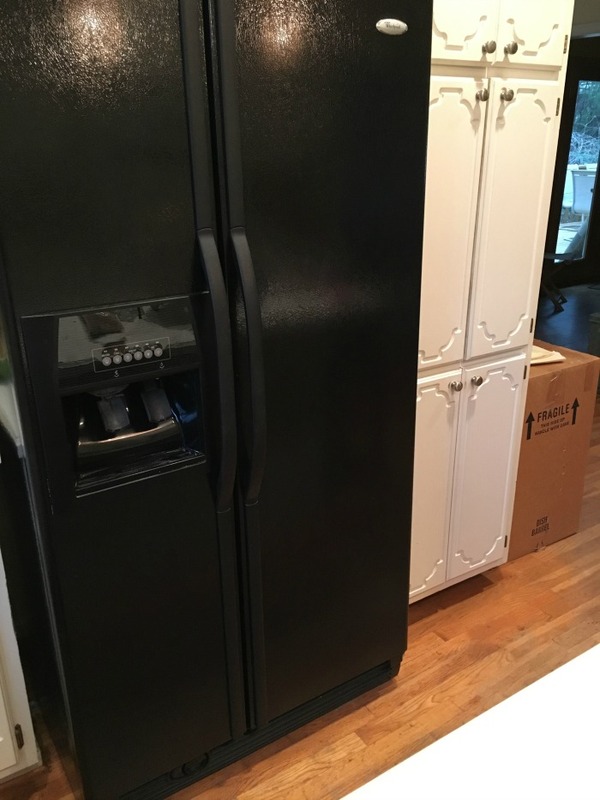 And why the black fridge when all other appliances are white, you ask. I asked the same darn question. Weird! 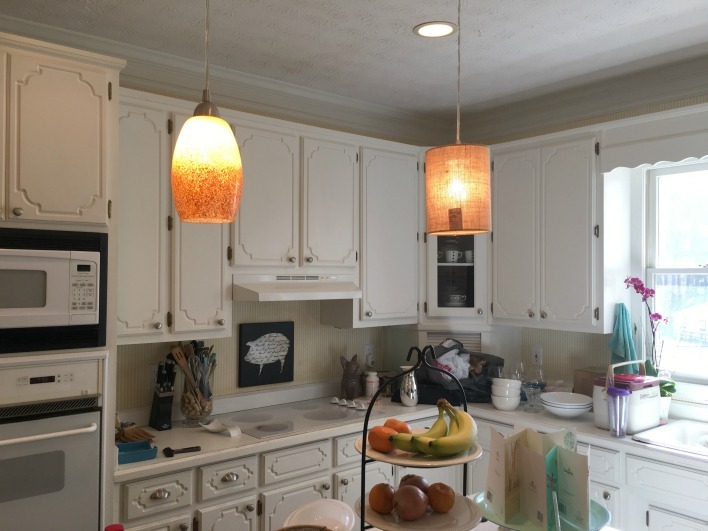 Once again, the lighting choices are not my flavor, so here I am partially done exchanging the brown and orange glass shade with my $12 burlap shade from Lowes! Please don’t mind the mess, we are unpacking! And then there’s the plumbing. 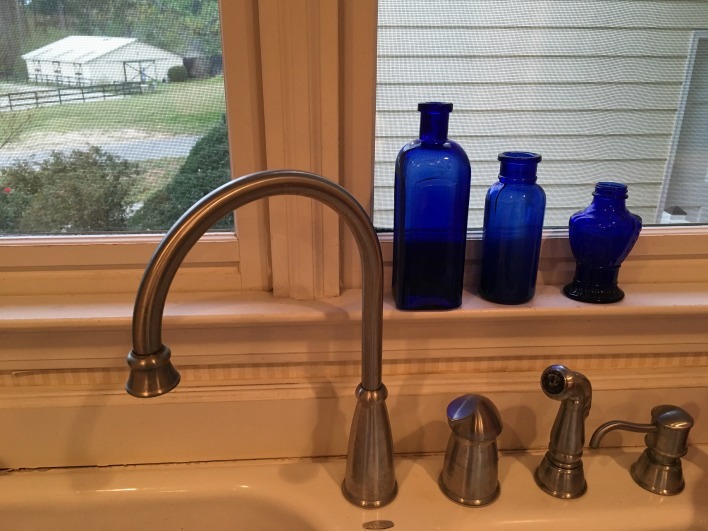 Our need-of-an-upgrade kitchen faucet runs at about 50%. Not sure if it is fixable or if we even want to fix it. It may be a replace it and forget about it kind of deal. 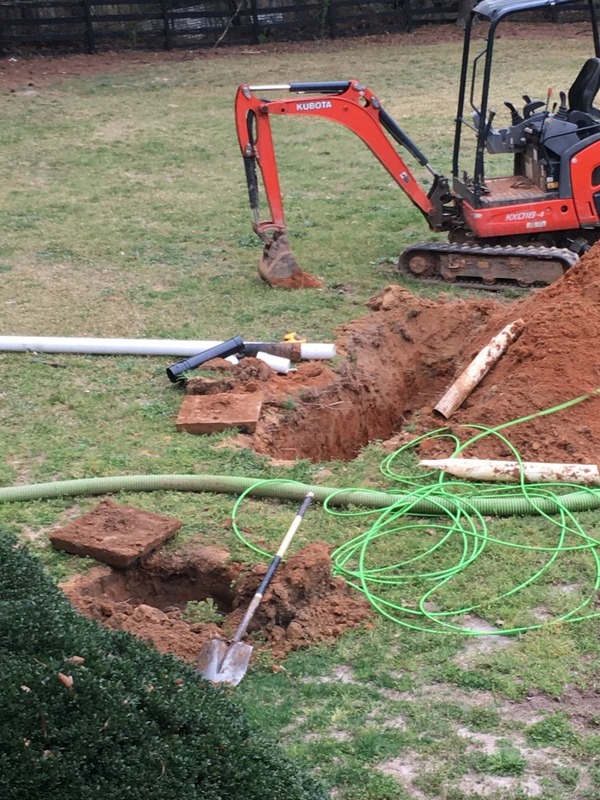 We will be calling Roto Rooter out to help with some of major plumbing issues in the very near future! Hmmmm….. where do I start. The renovation process will be long! In fact, I am only halfway done with showing y’all the rooms with issues that need to be worked on! 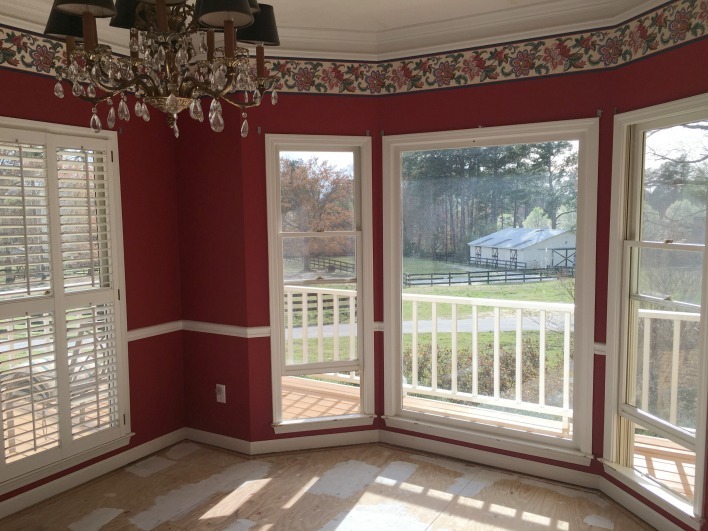 I thought breaking this whole fugly southern house reveal up into two sections would make explaining things a bit easier (and not too much of a picture overload!). The second day of living in the house we had plumbing issues that needed to be fixed ASAP! So after $2500 and two large holes in our front yard, we have the first of many plumbing snafus down in the books! So there will be many more unforeseen problems that come up I am sure. I do want to give Roto Rooter a shout out here. Not only do they fix your biggest plumbing issues, they also help with the little things too. Need help putting in that new kitchen faucet? They do that. Need help with a water leak? They have water restoration services. Need help reworking your fugly master bathroom plumbing (yes yes yes! ), they do that too! (I of course answered ‘yes’ to all of those questions!) They also have a whole line of plumbing products (some of which we already use and trust, and others that we are needing to pick up) for use in your home. Phew! 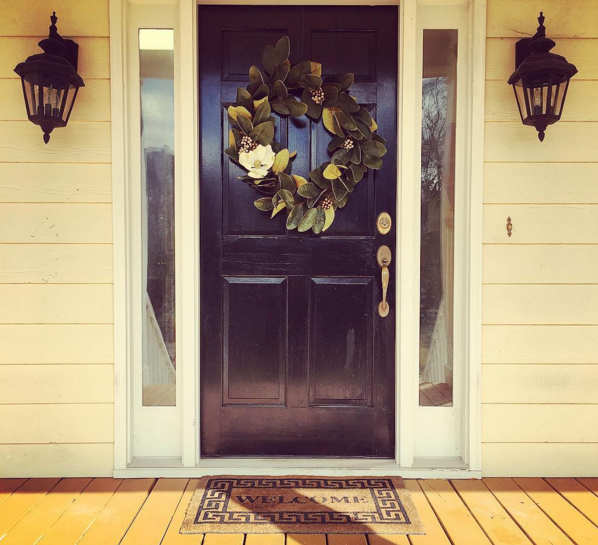 And that is our fugly southern home reveal y’all! We love it! Wow such a BEAUTIFUL home!!!! I absolutely adore the the entrance leading up. That is so dreamy. I saw that on snapchat the other day! And the barn next too it! I can’t wait to see all the awesome things yall do with it 🙂 Congrats!